After watching a double bill of Halloween 4 and Suspiria on Saturday night, I was definitely in the mood for a bit of seasonal baking on Sunday morning. I opted for chocolate biscuits using an excellent recipe from the Nigella Christmas book where the biccies are topped with festive-coloured hundreds and thousands (which, inexplicably, seem to be referred to as nonpareils in countries outside of the UK). In keeping with the current season, I used some orange and black hundreds and thousands from Wilton that I tracked down in a US Target store last October. 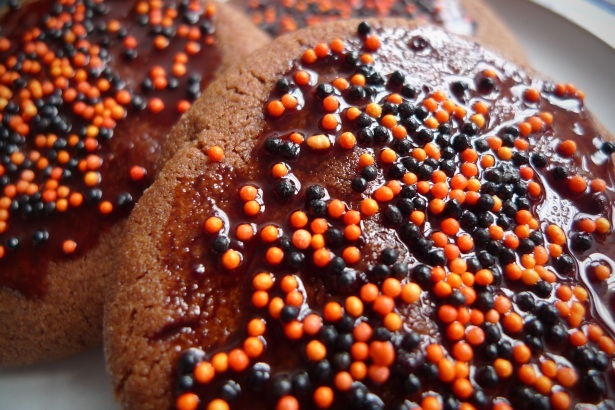 This entry was posted on 18/10/2010 at 12:52 pm and is filed under Biscuits, Seasonal food with tags Baking, Biscuits, Chocolate, Food, Halloween. You can follow any responses to this entry through the RSS 2.0 feed. You can leave a response, or trackback from your own site.